Joe is 14 and started skateboarding when he was 11. He has needed stitches on his leg but fortunately had no fractures. The boards are broken quite frequently particularly ‘when you jump off high things’. Skateboarding is a sport that is generally good for the health, but it has its hazards and these include broken bones. The most common are injuries to the lower limbs especially fractures around the ankle. Wrists and hands are also vulnerable. Any part of the body can be injured and in accident and emergency departments ribs, backs and faces (including teeth) often need to be X-rayed. Sometimes there is a fracture, sometimes not. 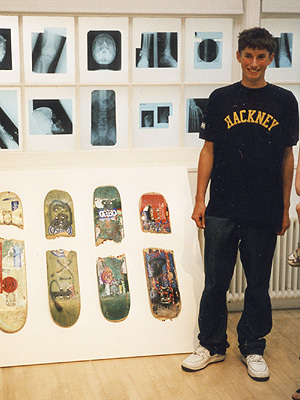 This is reflected in this collection of X-rays of skateboarding injuries gathered from three A&E departments. The most severe and life threatening injuries sustained while skateboarding are head injuries, principally caused by collision with moving vehicles while skateboarding on roads.